A relatively new trend at some science journals is the publication of video abstracts alongside the written article—in which the authors explain their findings on camera. Video abstracts are typically short (3-5 minutes) and often are freely accessible, either on the journal’s website or on a video-sharing site. What are the advantages for an author? By using video, authors can explain their work in a way that they are not able to do in print, such as showing footage of their experimental methods, field sites, and/or study organisms. The authors are able to provide a more personal explanation of their findings and put their work into a broader perspective. By posting a video on the internet, an author can raise the visibility of their research because search engines rank video high in comparison with text-only descriptions (especially if it’s the only video out there on the topic). People searching for information on a topic will be more likely to find their video abstract, and the video will lead viewers to the technical paper. The more people who are aware of the work, the more likely they are to cite it. Also, if the video is published on YouTube, the authors are free to embed their video abstract on their own websites, something they often cannot do with their journal publication because of copyright restrictions. Another important point, often overlooked by authors, is that they can reach a broader audience with a video abstract. For example, a video abstract may reach end-users such as resource managers or health-care workers who might not read the technical paper but would watch a five-minute video. Colleagues in other fields might also find your video interesting even though they would not read your paper. For example, as a scientist, I’m interested in keeping up with major discoveries in other fields. Although I’m not likely to read a technical paper about the Higgs boson, I would watch a video that explains what’s been discovered and what it means. In other words, a video abstract can greatly expand your audience beyond fellow scientists who read your journal articles. A video abstract that explains your work in everyday language also can be used to show the “broader impacts” of your work, for example, in a grant proposal to a government funding agency such as NSF or NIH. NSF, for example, requires proposers to show both the technical merit as well as the broader impact of the proposed activity on society. Videos that are accessible and understandable by a diverse audience meet the second criterion and serve as documentation of a scientist’s previous contributions in this regard. What are the advantages for the reader? Video can provide a richer, more interactive experience for a reader. Anyone can access such media without having a subscription or paying a fee—unlike the journal article locked behind a paywall. For non-specialist readers, a video in which the authors explain their work in everyday language would provide greater insight, spark their curiosity about the topic, and possibly encourage them to learn more about it. What if my journal does not publish video abstracts? Not that many journals support publication of video abstracts. However, this should not stop you from creating and publishing a video abstract on your own. The benefits, as outlined above, should be sufficiently motivating to justify the effort. You can publish your video abstracts on your own website on on a video-sharing site such as YouTube. In fact, because millions of people are searching YouTube for information, your video abstract will be more visible than if hidden on a less frequently visited website. What will the future hold? Video abstracts are part of an overall trend in multimedia communication of information on the internet, which has been facilitated by the wide availability of digital devices and software for creating and sharing videos. Some science disciplines seem to be getting on the video abstract bandwagon faster than others. Whatever the future of video abstracts, we are clearly in a learning phase. Many of my colleagues have either never heard of video abstracts or expressed little interest in doing one, even if offered the opportunity. Students seem to be more receptive to the idea, possibly because they are more technically-savy and accustomed to watching YouTube videos than their professors. If video abstracts become standard practice, authors will need to develop some skills at creating such videos (or have someone else do it for them (most likely for a fee)). At a minimum, scientists must understand how to design an effective video abstract. Unfortunately, there are few guidelines for authors who do want to create a video abstract. This entry was posted in Communicating with a Diverse Audience, Science Video Tips, Science Video Tutorials and tagged broader impacts, science communication, video abstract by Karen_McKee. Bookmark the permalink. First, I have to say I love your blog and what you do! In my role as Media Outreach Librarian here at the University of Minnesota, I provide our campus with a range of media support (primarily in teaching and learning contexts). I believe video use in the sciences is strong and growing, both in terms of student media projects and innovative scholarly communication. Pardon the cross post with your ResearchGate inquiry, your readers may be interested to learn that my research paper studying the emergence and usage of video abstracts in science journals was published yesterday in the Journal of Librarianship and Scholarly Communication (of course, I couldn’t resist creating a video abstract of my own!). I would love to hear your thoughts and those from your readers to better understand the science author video producers perspective more in-depth than I address in this initial snapshot study (e.g., perceived video abstract benefits/drawbacks as a form of communicating science research, personal experience with video abstract production, production support needs (particularly in university contexts), demonstrated usage in teaching and learning, use of Altmetrics to measure/communicate scholarly impact and potential for an evolution in gaining more acceptance for tenure/promotion considerations). Thanks for stopping by and leaving a comment. I think it is great that you’ve begun to examine video abstracts and their impacts. I also would like to hear from readers about their video experiences and perceptions about video abstracts and other video uses. 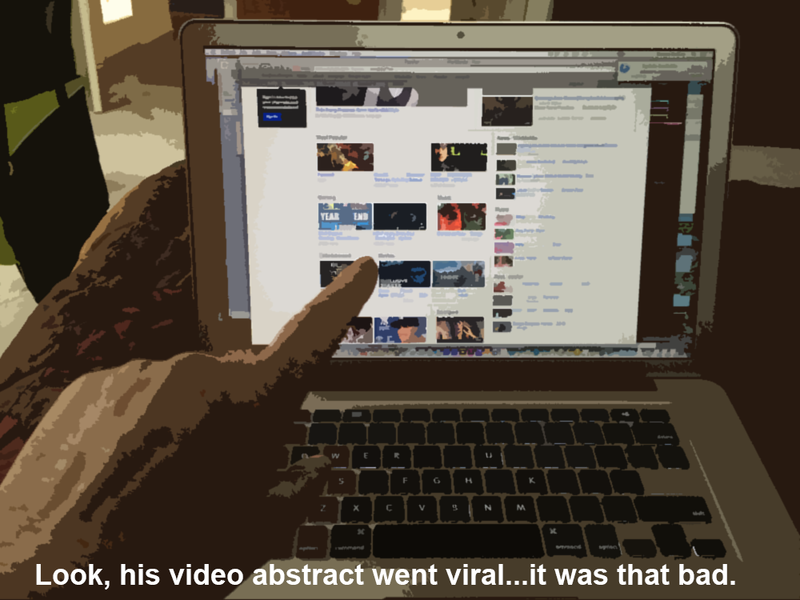 Wow, this is the first time I heard and read about video abstracts. Thanks for this valuable information. God bless you for helping researchers like me. God bless!